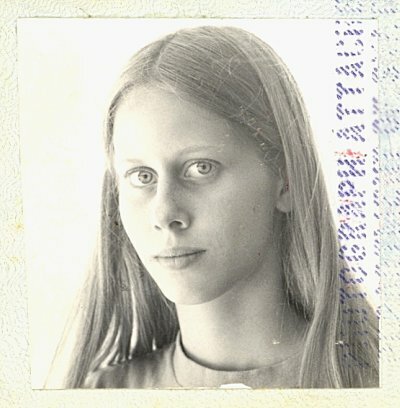 Passport photo taken by my dad. I remember this. You're so pretty. Too bad it isn't in color. Your eyes are so blue. You look like you. I like that it's black and white. I've always liked this picture. I'm glad I finally got it scanned in. What a marvelous picture! It captures the you that you became...you were, but you were still becoming, and it's you now, too. I agree. It's somehow more than just a photo. Look at you! Wonderful photo. A bit younger than when I first met you, but not by much. I know where you were going, I think, so won't ruin the game. Great to see this photo. My father turned on the light and I felt the warmth bouncing off the umbrella onto my face and he said look here and I watched him peering down into his old Rolloflex, finding me, moving his thumb along one of the wheels on the side of the camera, bringing me into focus and then zooming in a little more. Wow. This is tough. I like it. I flinched a little at first (I don't like sad things), but now it seems like it will be ok. Very cool piece. This process seems much more useful than nanowrimo although I found the Cooper's Indians group recently and it cracked me up just thinking of that essay. Cooper's Indians. Lol. You haven't changed a bit except you didn't have your hair in a tail. That seems to be the same t-shirt I saw you in last time, too. ...so WHERE did YOU GO with your passport at 16? It was summer 1971. My sister had gone backpacking around Europe with a friend. I got stuck at home with a case of mono and two summer school classes. In spite of the mono, I somehow got an A and a B. In the meantime, ndozo had a falling out with her traveling companion and was on her own. So, as a reward for the good grades and consolation for being sick most of the summer, my folks sent me to meet with ndozo and travel around Europe for the rest of the summer. Plane fares were low, but the dollar was not doing well. We did fine. We traveled cheap and had a good time. Wow. I have a high school picture that looks just like that.